Stocche Forbes has won LatinFinance’s award for Best Infrastructure Law Firm: Brazil in this year’s Project & Infrastructure Finance Awards. Stocche Forbes has been recommended by Latin Lawyer 250 in 2019, with 23 professionals and 13 areas cited. The Latin Lawyer annually publishes a guide with the most important law firms in Latin America. 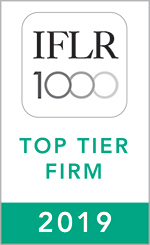 The International Financial Law Review (IFLR 1000) 2019 publication recommended Stocche Forbes in all areas of the guide: Banking, Project Finance, Capital Markets: Debt, Capital Markets: Equity, M&A, Private Equity and Project Development (Tier 1). We also had 6 of our lawyers recognized as “Highly regarded” in their fields, namely: Guilherme Forbes, Henrique Filizzola, Flavio Meyer, Miriam Signor, Frederico Moura and Marc Ribeiro; and 2 of our lawyers recognized as “Notable practitioner”: Rana Moraz and Alessandra Zequi; and 1 lawyer recognized as “rising star”: Laercio Munechika. The Legal 500 Latin America 2017 publication has recommended Stocche Forbes in 9 practice areas, as well as 23 of its lawyers. In addition, three lawyers were listed as leading lawyers, namely: Guilherme Forbes, Domingos Fernando Refinetti and Miriam Signor. We also had the lawyer Guilherme Gaspari Coelho recognized as "next generation lawyer". The Who’s Who Legal publication has elected 10 Stocche Forbes' lawyers among the best lawyers in Brazil, namely: Guilherme Forbes (Brazil - Project Finance and Global - Project Finance); André Stocche (Brazil - M&A); Flavio Meyer (Brazil - M&A); Domingos Refinetti (Brazil - Asset Recovery, Global - Litigation: Lawyers, Global - Business Crime Defence: Corporates, Global - Business Crime Defence: Individuals, Global - Asset Recovery: Lawyers, Brazil - Business Crime Defence and Investigations, Brazil - Restructuring & Insolvency, Global - Restructuring & Insolvency and Brazil - Commercial Litigation); Paulo Casagrande (Global - Competition: Lawyers, Global - Competition: Future Leaders - Partners e Brazil - Competition); Rafael Passaro (Global - Litigation: Lawyers); Alessandra Zequi (Brazil - Corporate Governance); Clarissa Oliveira (Global - Investigations: Lawyers); Renata Emery (Brasil - Corporate Tax, Global - Corporate Tax: Advisory and Global - Corporate Tax: Controversy) and Bruno Bercito (Brazil - M&A). Seven of our lawyers are on the list of recommended lawyers in 2019 "Lacca Approved", having been voted by legal departments of companies in Latin America as one of the best lawyers in their practice areas, namely: Guilherme Forbes: Banking & Finance; Marcos Canecchio Ribeiro: Banking & Finance; Henrique Bonjardim Filizzola: Capital Markets; Flavio Meyer: Corporate / M&A and Domingos Fernando Refinetti: Litigation; Rafael Passaro: Litigation; and Renato Coelho, Renata Emery and Pedro Simão: Tax. Stocche Forbes has been considered one of the most admired law firms in Brazil by Análise Advocacia 500 – 2018 in the areas of Environmental, Civil, Consumer, Corporate Contracts, Regulatory, Financial Transactions, Corporate, Tax, arbitration, Compliance, Antitrust, Real Estate, White-Collar Crimes, Labour and Social Security. We also had 15 lawyers recognized by the publication. The 7th Edition of the International Tax Leaders 2018 (an International Tax Review publication) has recognized Renato Coelho and Marcos Prado as leading lawyers in indirect taxes and the 8th Edition of the Tax Controversy Leaders 2018 has recognized Marcos Prado as leading lawyer in tax controversy. 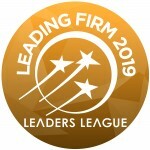 In the 2019 edition of the Transactions & Deals Rankings by Leaders League Brazil, Stocche Forbes Advogados was recognized as one of the best law firms in Brazil in the following practice areas: M&A; Large-Cap M&A; Capital Markets; Private Equity; Banking & Finance; Projects & Infrastructure; Merger Control; Real Estate; Bankruptcy; Tax Counsel; Tax Litigation and Labor Counsel. In addition to the areas above, we are already recognized by the Litigation & Arbitration Rankings in the areas of Civil and Commercial Litigation, Arbitration and Antitrust Investigatons.